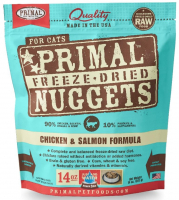 Freeze-dried food and treats provide the benefits of a raw diet without the mess or the hassle. By dehydrating, air drying or flash freezing, vitamins, nutrients, enzymes and minerals remain completely intact while moisture is removed for shelf stability. 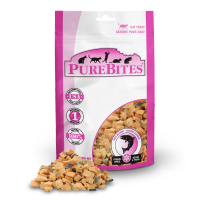 Because the good stuff isn't cooked down, the raw protein and edible bones provide amino acids and dental health that kibble and canned simply do not. Most freeze-dried recipes require mixing with some water, and bingo! A few minutes later, the most delicious, nutritious meal is ready to devour. Shop PetFlow for the best freeze-dried brands including Stella & Chewy's, Primal, Vital Essentials and more. With optimal raw protein, grain-free nutrition and unbeatable taste, freeze-dried foods can be fed as delicious mixers, tasty treats or healthy full meals.